Someone got a good deal on this Spalding/Reach full web glove for $25 on ebay. Glove above is back on ebay, this time with way better pictures. It has a Reach cloth patch. It will probably do better than $25 this time around. Last edited by mikesglove on January 16th, 2014, 10:17 pm, edited 1 time in total. Goldsmith "Big Leaguer" model sold for $610. Inner lining is mostly gone. The glove has seen a lot of use. Surprising the finger webs are still intact. The black and gold patch is not often seen. A different design than the "Heine Groh" version and has an earlier look to it with a true full web and high placement of the finger webs. May be a pretty rare glove. 1950's MacGregor "Richie Ashburn" model GB23 glove sold for $84. Glove is in super condition and features the "Spider Web". 1950's MacGregor Goldsmith "Ralph Kiner" model glove sold for $155. Glove is a little soiled but in great shape and features the "No-Rip" thumb design in addition to the cool looking "Snare" webbing. Ok get to postn those seriously cool gloves, Wow!!! hope they turn out well for the winners... big night for some serious leather!! Congrats winners!!! A 1930's Reach "Mickey Cochrane" catchers mitt sold for $249. Highly sought after and a super looking example. Strong prices for some nice gloves - good to see. A stellar D&M "Lew Fonseca" model 670 base mitt sold for $150. Top of the line and rare buckle web model from the 1930's. Markings are very bold on the front and the cloth patch is the late style and intact. Just a great mitt! 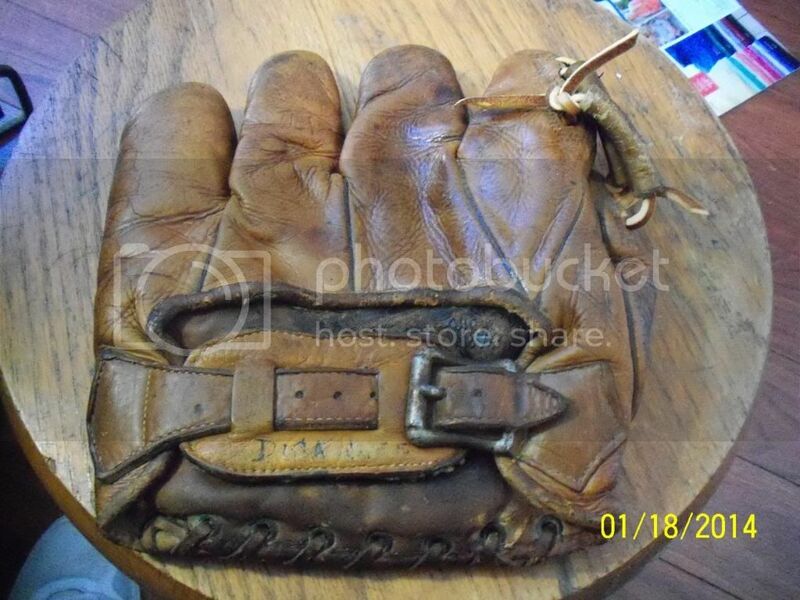 A 1930's Spalding "Big League" model glove sold for $440. Highly sought three finger model in good overall condition. That Spalding three finger was a beauty - strong price too! Here's an interesting glove that sold for $82. Don't see the button enclosure too often. Didn't look like a high quality glove but still cool/different. Hope picture posted, if not it is ebay 191042045542 nabbed this cool reversed buckle back, rolled piping, wool padded wrist pad, and turned out soft inside and out.. and in true Drokester fashion, it is a Hickie model!!! Who is Burton Hickies??? Anyway it is one heck of a nice glove, got a bunch of cleaning to do to make out the maker, but dang, fits in my collection, and thanks to Eric for the help. Eric's got some dandy gloves and a great guy. Below zero here last night, 50 tomorrow... yep will be sicker then a dog..
P.S. If you ask your wife if you can drop some serious change on a glove in the woods, and she doesn't hear you, does that mean YES?? ?